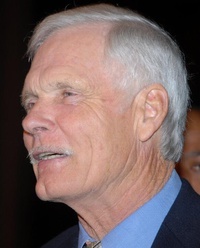 Robert Edward "Ted" Turner III (born November 19, 1938) is an American media mogul. As a businessman, he is known as founder of the cable news network CNN, the first 24-hour cable news channel. In addition, he founded WTBS, which pioneered the superstation concept in cable television. As a philanthropist, he is known for his $1 billion gift to support the United Nations, which created the United Nations Foundation, a public charity to broaden support for the UN. Turner serves as Chairman of the United Nations Foundation board of directors. Turner's media empire began with his father's billboard business, which he took over at 24 after his father's suicide. The business, Turner Outdoor Advertising, was worth $1 million when Turner took it over in 1963 (Roughly $}} in present day terms.). Purchase of an Atlanta UHF station in 1970 began the Turner Broadcasting System. Cable News Network revolutionized news media, covering the Space Shuttle Challenger disaster in 1986 and the Persian Gulf War in 1991. Turner turned the Atlanta Braves baseball team into a nationally popular franchise and launched the charitable Goodwill Games. He helped reinvent interest in professional wrestling when he owned one of the most popular wrestling companies of the middle to late 1990s known as World Championship Wrestling (WCW). The Monday night show that it put on was the highest rated on cable and helped boost Turner's channels of TNT and WTBS. This webpage uses material from the Wikipedia article "Ted_Turner" and is licensed under the GNU Free Documentation License. Reality TV World is not responsible for any errors or omissions the Wikipedia article may contain.